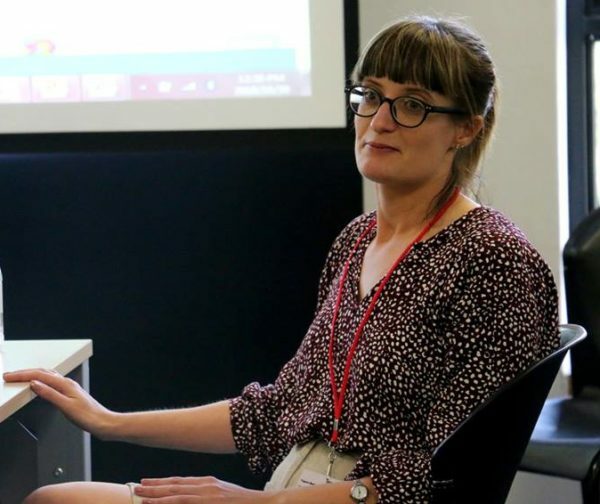 Tegan Bedser, a digital media specialist at the SABC, emphasized the importance of knowing how to use forensic tools to support investigative reporting. Bedser was leading a workshop on how journalists can use computer programs such as Google Earth to do in-depth reporting. The workshop was held during the African Investigative Journalism Conference (AIJC) at Wits University on Tuesday, October 30. The session was based on an investigation by Africa Eye, a news program at the BBC. The show, which was launched in April 2018, is a “documentary series offering high-impact investigation and in-depth reporting from across Africa,” according to the BBC’s website. One of their most recent investigations helped to disprove claims by the Cameroonian government that a video circulating online of an apparent murder by Cameroonian soldiers was fabricated. The video showed soldiers killing two women and two young children in early July 2018. Bedsar said the video explaining how the BBC nailed the Cameroonian soldiers may have taken months and even close to a year to gather all the information, interviewing of experts and putting everything together in different formats. “The story didn’t stay in a traditional format. They put the story on social media and did a Twitter thread and Instagram story. Journalists should consider social media not as an after thought,” Bedsar said. Bedser showed the audience how journalists at the BBC Africa Eye used forensic tools to analyse the video and show where the killings took place, identify the soldiers involved by name, and when the murders occurred. The journalists working on the video utilized open source tools, including Facebook graphs, Google Earth, and Suncal, a freely available tool that allows users to follow sun patterns. The one tool that journalists make the most use of is Google Earth because of its ability to show precise locations. Bedser showed the audience how to use Google Earth and emphasized the importance of knowing how to use this tool. South Africa’s TimesLIVE publication did a similar video to the one by Africa Eye. They focused on the vicious murder of Hannah Cornelius in Stellenbosch.She says the publication used Google Earth extensively, whereas the BBC also used Open-source intelligence (OSINT) for their investigation. Forensic tools can play a crucial role in investigative reporting. They also act as a faster and an expedient method of data collection through numerous websites. In addition, these tools form part of a very important form of exposing the truth in instances when governments attempt to hide information from the public.